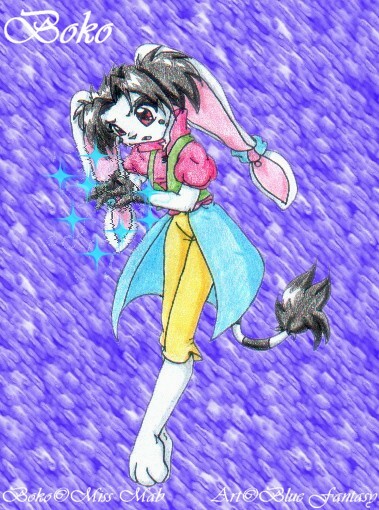 Dislikes: Most everyone, crowds, Uniforms, Dressing up in anything. Special Abilities: Ice spells, great understanding of fire spells. 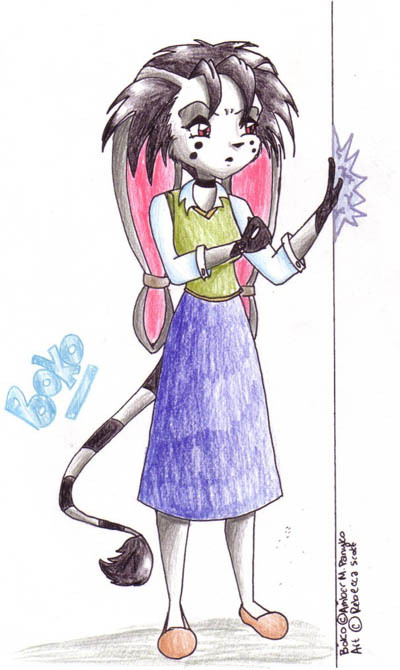 Special Abilities: Earth magic, can summon "jenny"
Boko isnt usually the happiest of beings. Most of the time she prefers to be alone and often shuns social gatherings, sticking to solitude. Despite her loner tendancies, she does allow herself to be a part of a small group of other students who arent the most popular of beings. A highly skillful ice mage, her scores in general and specialized are in the top 10 students, giving her some leeway in the eyes of the Acadamy, who had she not such stellar academic records, would probably of removed her for such un-whitemagelike tendancies. Its unknown if what Boko wears is due to a simple lack of fashion tendancies or if she just doesnt care, but its usuallly easy to spot Boko in a crowd due to the odd assortment of clothing articles she wears. 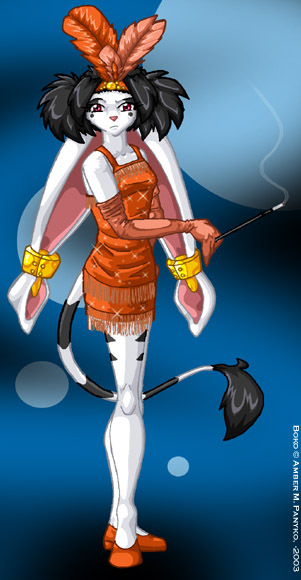 Its also noted that her face markings seem to change almost like makeup would but its unknown the reason why. 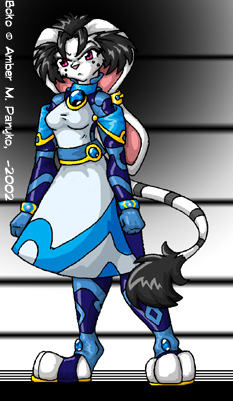 Almost always will Boko be wearing a set of Golden ear-cuffs, which she claims them and the tongue-piercing are part of her cultural beleifs. When not sulking, Boko seems to be highly loyal to those she calls her friends, but is often untrusting of anyone save for the closest. She respects those who work hard and seems to hold a slight bitterment to those who get by on popular cliches and breeze through the system just for being naturally lucky. 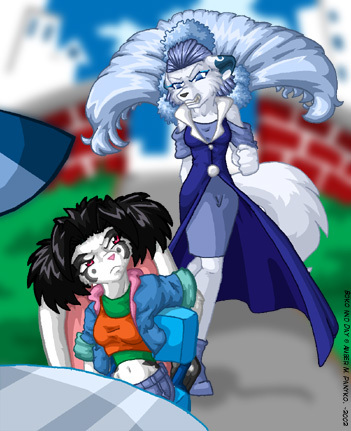 Among these her and a fellow ice mage "Day" seem to have a long-lasting grudge against eachother. Not much is known about her family as she tends to not talk about her past or them save for fondly mentioning a sister of hers who she seems to hold in great esteem. Boko seems to keep a lot of secrets to herself and sometimes its wondered if she's hiding something as she seems to know about a lot more things than one would guess. Unlike Boko, Anthicus is actually at the Acadamies based more on family influence than through high grades. 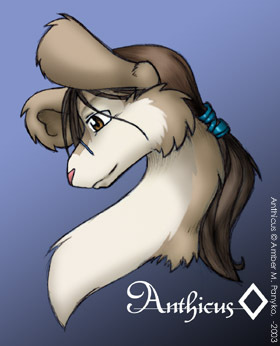 An overall lighter personality, Anthicus tends to act rather overprotective of those he considers his friends. A bit more on the popular scale, it seems Anthicus prefers to take the low grounds and avoids making himself appear better whenever he can. The glasses Anthicus has are actually optically imbedded so they hover in front of his face following where his eyes move. They also allow him to see in the dark, through rain, as well as turn off when sleeping. Relatively new technology in a sense. Anthicus avoids talking about his family whenever possibly due to what seems like a bitter grudge against them. It is known that the Karvis Dan species is known to be rather haughty and uppercrust, often using other species for their personal means. Due to some incidents in the past, Anthicus has made it his priority to make himself as little like his species as possible. 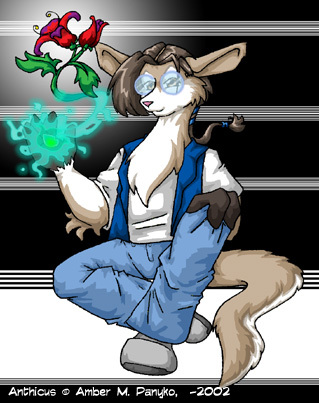 An average Earth mage, Anthicus is unique in being able to summon an Earth Elemental he calls "Jenny". 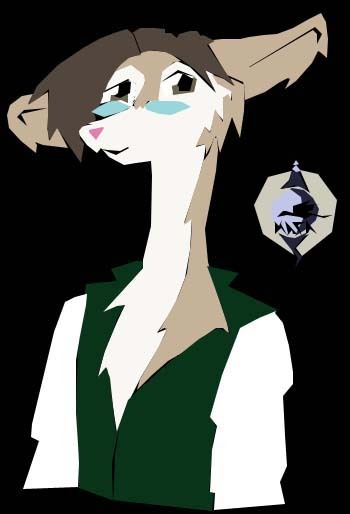 His fierce loyalty and sometimes naiveness of a situation often leads to some misunderstandings now and again, but overall Anthicus is a generally trusted being who's made it his priority to suceed without his families interventions. Yet despite his best efforts, he finds his family and his culture somehow still managing to dictate his life for him, which only fuels his desire to become more and more unlike them. 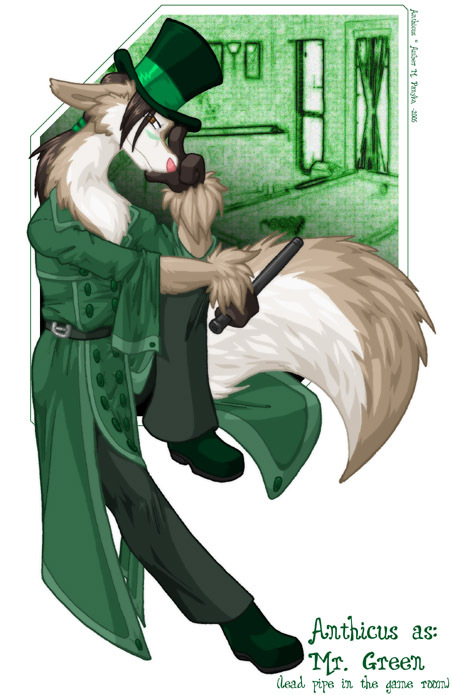 NEW Clue Green: Anthicus as Mr. Green with a lead pipe and seeming sorta smug about it. Ice Garden: Boko in a garden practicing a little incantation. It must be nice to be immune to cold. Possessed: Anthicus being a little not himself thanks to a bad dose of magic. 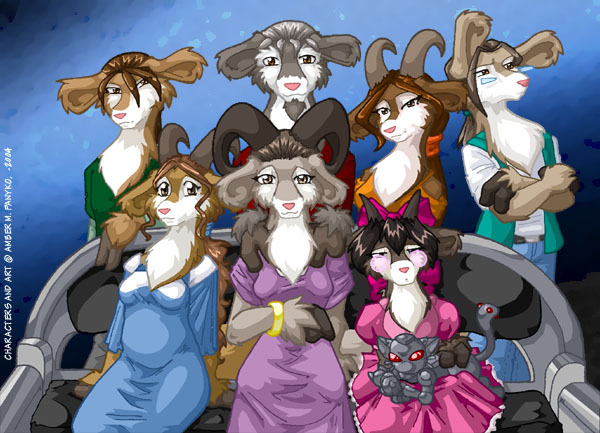 Anthicus' family: A family shot of Anthicus and his family. He's not a real joy to photograph. Boko Flapper: Another historic series, this one of Boko during the flapper era of the 1920's. 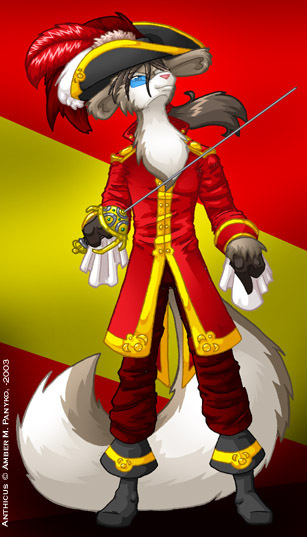 Anthicus Pirate: Part of the historic series has Anthicus dressed as a Privateer. Smug aint he? Boko Back: Bokos back markings...whoo fun. Casual Elementals: Jenny picking on Anthicus in a casual conversation between the two. Boko Grrrr...: Boko looking a bit upset, likely cause she's missing her outfit or something. Glare Down: Boko and Day exchanging not-so-happy glances. 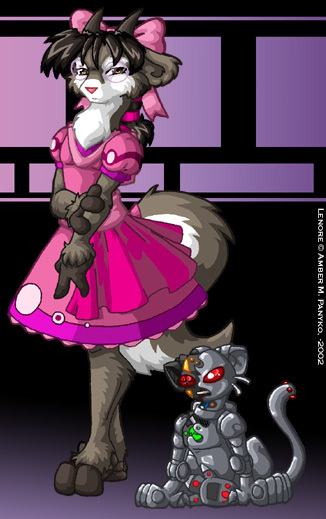 Lenore: Anthicus' youngest sister Lenore and her pet/toy "kitty"
Jenny Summon: Anthicus' Earth spell for the spell series. His summoning of the Plant Elemental named Jenny. Ice Grasp: One of Bokos more visually impressive Ice Spells. Part of the spell series. Anthicus Bishou: Anthicus looking rather bishie for once...at least I think so. Trippy background. 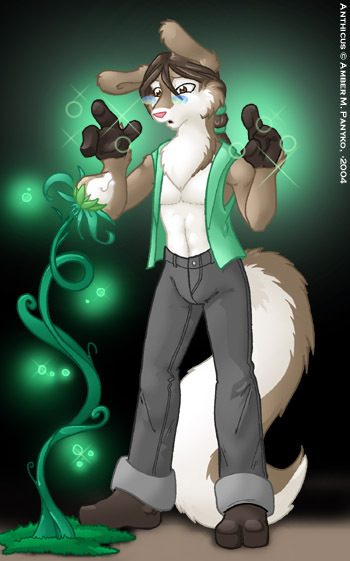 Anthicus Casual: Anthicus casting a minor plant spell. 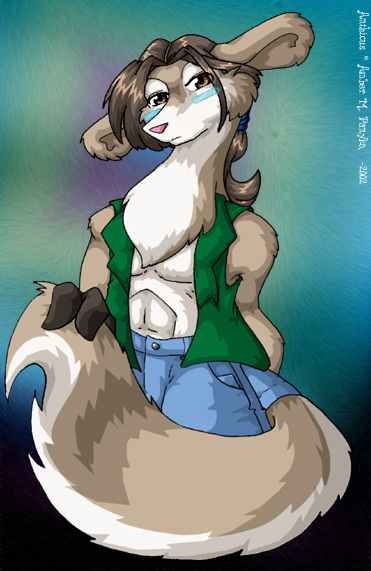 Boko Casual: Being her tacky self, Boko in one of her more relaxed attire. Old Profile: Another old profile image, this one with stats. 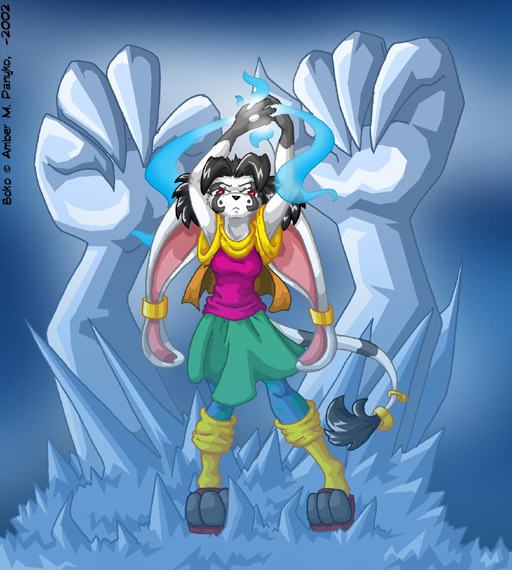 Rebecca: Boko casting her ice spell on a wall. Done in colour pencils and very nice. 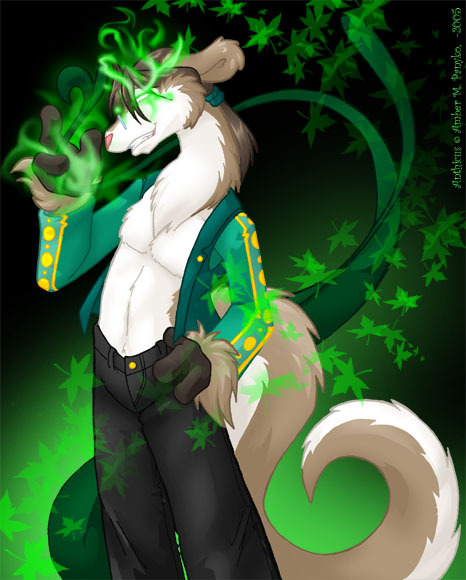 Ozzy: This picture of Boko in the lamplight is so good, I cant begin to praise it properly. OOC: A hilarious little strip(guest starring Dan) of a very Out of Character Boko and Anthicus, done by Tailsteak. 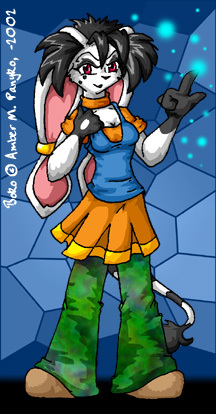 Tim: Boko putting her ice abilities to a more conventional use. Smile: Boko being more pro-active than normal. Popular beware. Kata: Anthicus done in a very unique style. Reminds me of those paper cutouts. Most keen. "Careful now...don't want to destroy the steriotype do you? -Boko"